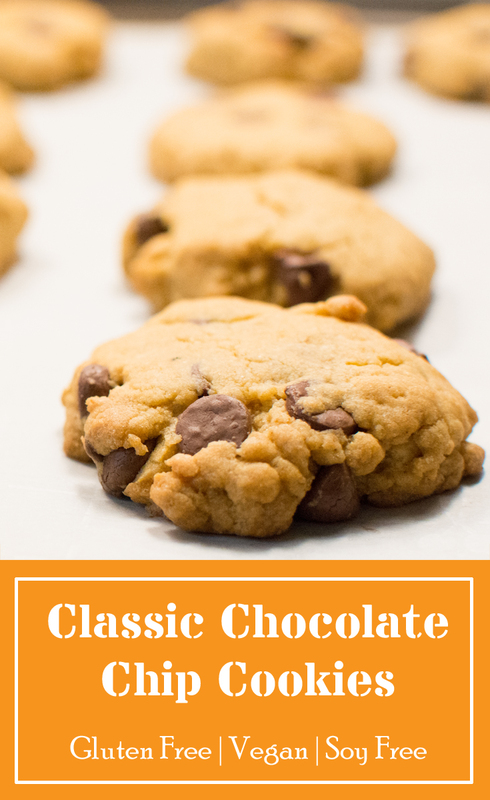 Gluten free, vegan and soy free classic chocolate chip cookies. I have been craving a good ole’ chocolate chip cookie! 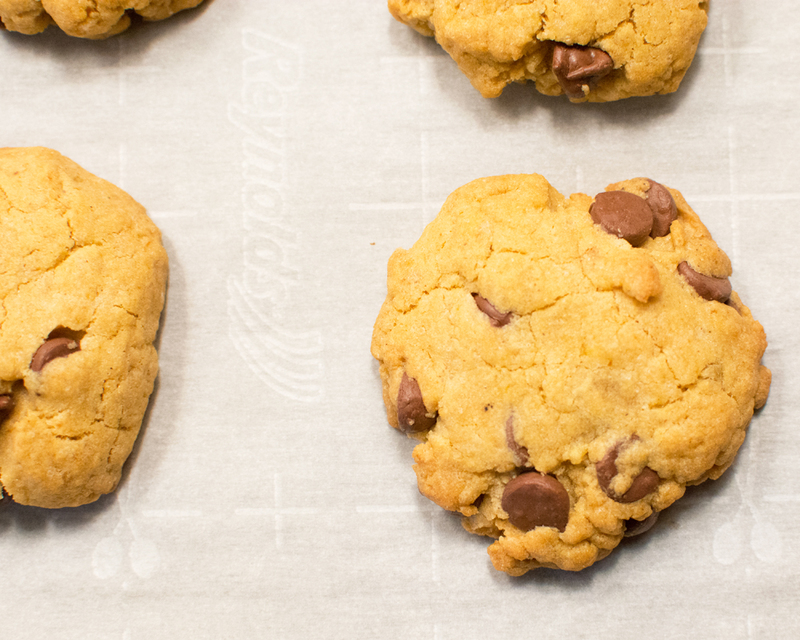 A homemade chocolate cookie is the best thing for a chocolate chip cookie craving. I tried the store bought cookies, but it just wasn’t the same. So I started looking for what makes a good chocolate chip cookie. I found the usual classic recipe and decided to try to substitute for the eggs, wheat flour, and go with the vegan and soy free chocolate chips. I made a few more adjustments just to keep it a bit more moist. I used pumpkin puree for the eggs, Bob Mill’s cup for cup flour for the wheat flour, and earth balance soy free margarine for the butter. Also, I used enjoy life’s vegan, gluten free and soy free chocolate chips. The chocolate chips are much cheaper online than in our local health food store. Almost 7 bucks at the store and $3.75 each online when you buy 6. Great for stocking up, especially for the holiday baking spree. You can purchase a six pack of them from Amazon here. These cookies remind me of the ones I used to make with my mom. Super sweet and soft, but firm. It is hard to tell them apart from a regular cookie. My daughter was in a painting mood and not a baking mood so she didn’t help me out with these. Well, she helped me eat them! They are four year old approved as well as husband approved. I will try them out at the parent meeting this up coming week and we shall see what they have to say! Letting the batter sit and the flour absorb the moisture is key to this recipe. It really helps with the grainy texture. The longer the better, but minimum 20 minutes. I do find that they work better as smaller cookies. I would say that seems to be true for most gluten free baked goods I have made. My theory is because the flours are dense they can’t be too thick or they seem to not cook all the way through or evenly. These, like regular cookies, do need 30 minutes to cool before you move them if you don’t want them to break apart. They are however amazing when warm! So eat a couple falling apart ones and let the others cool. If you like cookies that are easy to make and similarly allergy free check out my thumbprint cookie recipe here. Add the pumpkin puree, vanilla extract and sugars together. Then add the melt margarine warmed to room temperature, melted, but not hot. Lastly add the dry ingredients. Mix well and set aside for 20-30 minutes. The longer you let it sit the better. The flour tends to be a bit dry and dense so letting it sit gives it time to absorb more of the moisture of the other ingreditents. Add the chocolate chips evenly. Form small, 1 - 1.5 inch balls and them flatten them into the shape of a cookie. These cookies do not spread or change shape much during baking so make sure to leave enough space for flattening them, but don't worry too much about them getting much bigger than that. Cook them for 7-10 minutes. Do not over cook them as the bottoms will burn first check often. Let them cool for 30 minutes before moving them from the parchment paper. Or just eat them really warm, but try not to burn yourself. Please credit recipe to correct source.